Yellowstone is the oldest and perhaps most famous national park in the world. Established in 1872, it covers over two million acres of Wyoming and spreads into neighboring Idaho and Montana. Over the years it has gradually become valued not simply as a vast outdoor play area but also as a national treasure – it eventually gained the status of United Nations World Heritage Site in 1978. Management of the park has long been a source of controversy. In recent times, locals were outraged to find that emissions from snowmobiles there were higher than in the traffic of downtown Los Angeles. Also the culling of more than 1,000 bison, mistakenly thought to be carrying livestock-threatening disease, was misguided to say the least. 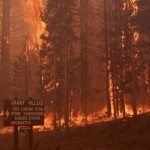 However, nothing has stirred more debate than the management of naturally occurring fires in Yellowstone. Until the 1970s it had been the procedure of the Park Service to tackle and extinguish these spontaneous blazes. This interventionist policy enabled older trees to survive and dead ones to lie where they fell, storing up problems for the future. So much dead wood made the entire park a giant tinder box just waiting for the right conditions. In 1988, the ideal forest fire conditions duly arrived. Spring had been relatively warm and dry and these conditions stretched into the summer. Multiple lightning strikes hit the park and, combined with the parched conditions and a strengthening wind, the park authorities found themselves dealing with huge wildfires that they could do little to control. Despite the best efforts of around firefighters who tackled the enormous conflagration from the air and on land, and the expenditure of nearly $120 million, the fires raged for months. On one August day alone, more than 600 sq km (232 sq mi) of Yellowstone were lost to fire, and cities downwind were covered in ash. Death toll: There were two deaths outside the park attributed to the fires. You should know: It is probable that the massive intervention by the authorities had little or no effect on the fires. In fact it may have harmed the area by introducing so much water which, combined with a subsequent wet spring, caused considerable soil erosion, while this level of wildfire occurs only about once in every 250 years, it is still part of the life cycle of the park. New vegetation has grown rapidly, seizing its chance to replace the old. In the decades following the fires the park has successfully regenerated.